Even though it has been part of Pocket GTViewer since version 3.0.x.20, one of the lesser known features of Pocket GTViewer is the Reference Point. The Reference Point provides a very simple function; it allows you to place a fixed point in your map view and a special arrow on the GPS indicator will always point toward the Reference Point. The Reference Point dialog provides 2 ways to place a Reference Point in your map. The Place Button allows you to interactively place the Reference Point by tapping a point in the map view. The At GPS Point button (which is only enabled when the GPS is tracking) will place the reference point at the current GPS position. 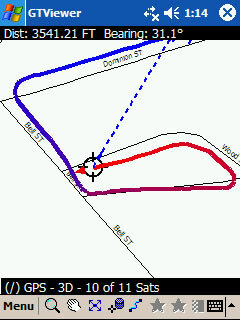 Two more options are available to provide more information while the GPS is tracking with a Reference Point. 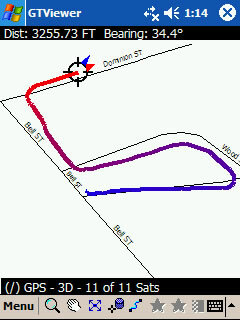 Show Path will draw a dashed line between the GPS indicator and the reference point. This line is sometimes more informative than just an arrow pointing in the direction of the Reference Point. The Show Info option will cause the Distance and Bearing from the GPS Indicator to the Reference Point to both display at the top of the map view. 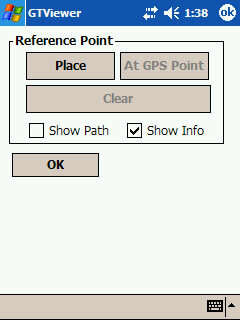 The following screenshots show the Reference Point with the Show Path and Show Info options enabled as well as the Decaying GPS trail. 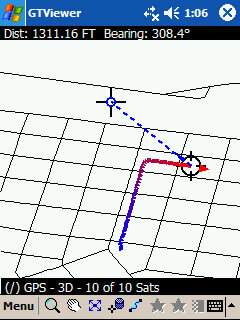 The GPS indicator will use a Blue Arrow head to point to the Reference Point while a Red Arrow head indicators the current heading. There are also several other options available for the Reference Point. In the .GTM file, you can add several entries to the Additional Properties section to control certain aspects of the Reference Point. RPCol can be used to specify the color for the Reference Point. The default is Blue. Color is specified as a RGB component color value. 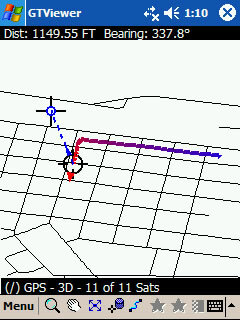 RPStyle can be used to specify the line style id used for the line connecting the GPS Reference Point to the GPS cursor. The value can be 0 to 7. The default is 2 (dashed). 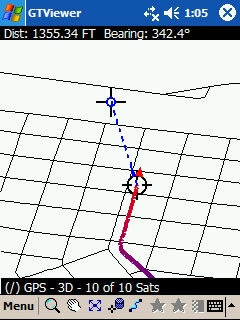 RPWeight can be used to specify the weight of the line connecting the GPS Reference Point to the GPS cursor. The value can be 0 to 15. The default is 2. RPPos can be used to specify the location of the default position of the Reference Point, such as your home office, etc. RPProp is can be used to specify the default options (Show Path and Show Info). The Reference Point can also be controlled via the Developer’s Framework and the Reference Points current location is always available to external applications. Version 5.0.x.17 of GTViewer is available. - NEW - Log File message has been added for Query locates when a category id is not valid. - FIX - The Style Manager's import style definition's ignore if already exists option was not working. It was not ignoring style definitions that did not already exists. - NEW - Location based details can now overlap existing geographic data. All categories except the detail categories will now be automatically turned off when a detail is located. - NEW - Queries to items in Detail files will automatically turn off all categories except the detail categories when the features is located. April 26-27 in Tampa immediately following GITA's Annual Conference. Ten Sails Consulting and a panel of expert mobile GIS technology users discuss current system capabilities and real-world implementation experiences with systems from GTi, GSIWorks, MapFrame, and Tensing. This session will include short presentations from the panel members followed by an interactive "open mic" session to answer questions from the audience. As with most of the really nice features in GTViewer, their inspiration came from customer requests. The session management in GTViewer has continued to evolve over the life of the product and with the latest enhancement (requested by a customer), an even better approach can now be taken with session management. There have been two posting on Sessions in the last few months. Sessions 101 discussed the basics of session management and Sessions 102 discussed a new feature. This posting, Sessions 103, is a further extension to the new feature discussed in the Sessions 102. The ExternalSessionsOnly flag (in the Additional Properties section of the .GTM file) was added in GTViewer 5.0.x.10. When set to 1, it prevented any user from accessing the internal session of a .GTX file. While using external sessions with a .GTX file was not new, there was previously nothing to prevent a user from using it, and the default file opening mechanism was geared to run in the internal session mode. Thus, this one flag ensured that no internal sessions would be used. Remember that there is nothing wrong with using the internal session in a .GTX file in single user mode, but multiple users sharing the same .gtx file must use external sessions. Also, keeping the session separate from the .gtx file means that the .gtx file can be replace without worrying about exporting any redlines from the .gtx before updating it. While the ExternalSessionsOnly=1 setting streamlined session management in GTViewer and prevented users from intentionally or accidentally using the internal session in a .gtx file, it still left some of the session management responsibilities up to the users. If the user opened a .gtx file, did some work, then existed; GTViewer would ask for a location to save the session. Then it was the user’s responsibility to use the session he or she created the next time around. It turns out that a common workflow is to have users always use the same session, even if the parent .gtx file is updated. So, having the users specify the name and location of the session file and remember to use the session file they created instead of the .gtx file is a unit of work that can now be eliminated by using ExternalSessionsOnly=2. This new option will default the name of the session file to be the same name as the .GTX file (except for the .gts extension) in the same directory. If a user opens a .gtx file with this ExternalSessionsOnly set to 2, GTViewer will first check to see if a session of the same name exists. If the session does exist, it will be opened instead of the .gtx file. If the session file does not exist, the name of the session file is automatically assigned the same name and path as the .gtx file (only with a .gts extension) and will be saved when the .gtx file is exited or explicitly saved. Thus, the session management responsibilities can now be removed from your users completely if your workflow fits within these confines. There are many users who keep several different sessions for a single .gtx file and this option is not appropriate for those users (the ExternalSessionsOnly=1 might be a more flexible option for them). The ExternalSessionsOnly=2 option will also work with .GTM files. There is not internal session in a .GTM file, but the automatic naming of the session and checking to see if a session of the same name exists and opening it instead of the .GTM file can still be useful for removing session management responsibilities. Version 5.0.x.16 of GTViewer is available. - FIX - The Address Query was not zooming to the desired Query Zoom for specific address values. - NEW - ExternalSessionsOnly entry in the Additional Properties section can now be set to 2 which creates a default session when opening a .gtx or .gtm file to be a file of the same name (only with a .GTS extension). If this mode is used in a .gtx or .gtm, opening the .gtx or .gtm will first check for the existence of the .gts of the same name and open it first. - NEW - The Print to Scale command will now zoom out automatically if the cookie-cutter is larger than the view. This automatic operation prevents the need to manually zoom out when the cookie-cutter is too large to fit in the current view. Version 5.0.x.6 of GTVx is available. - FIX - When showing more than one Preview image in the Attribute Info Dialog, tabbing between the preview images did not update the image unless you tabbed to a different type of tab. - CHG - If a group element has an invalid complex flag, it will now draw as a regular group. - NEW - CountFeatureSummary and CountFeatureDetails now support Shape with Holes Element as the the selected polygon. - CHG - Selected element used with CountFeatureSummary and CountFeatureDetails is not reset after the methods are run. - NEW - Feature Counting now supports Shape with Holes elements, closed linestrings, and groups with connected sub-elements as the selected polygon. - FIX - CountFeatureSummary sometimes returned a bogus length for point features when the length should always be 0. - FIX - Locate Address now behaves the same as it does in GTViewer. If a fit of the feature is less than the query's zoom level, it will use the query zoom level. - FIX - Saving Character to .GTS session files with with ASCII values greater than 127 would get their character value inverted. The GTViewer family of products (GTViewer, Pocket GTViewer, GTVx, and GTWeb) has always provided support for Wildcards (*) in queries. Wildcards allow you to only enter part of the value you are searching far and give you more flexibility when performing a query. By default, all queries perform a “Begins With” search. If you enter the first part of a value you are searching for, the query will return all records that begin with the value you entered. There are, however, several modes you can use when searching: Begins With, Ends With, Contains, and Exact Match. To illustrate these different search modes, each mode will be described below. You could enter just 1234 in the query prompt. Since a “Begins With” search is the default, you do not have to add the Wildcard at the end of the prompt value, but 1234* is the equivalent search string and both it and 1234 will return all records whose values begin with 1234 such as 123456789, 123400000, 12345555, 1234, etc. You can also perform an “Ends With” search by placing the wildcard at the beginning, such as *6789 which will return 123456789 but also all records that end with 6789 such as 0006789, 111116789, 6789, etc. The “Contains” search is a combination of the “Begins With” and the “Ends With” search modes. This mode is specified by placing a Wildcard at the beginning and end of the prompt value. So, if you specify *456*, you will get all records that contain 456 in their value such as 123456789, 111456111, 456, 456789, 123456, etc. Lastly, the “Exact Match” search method is a way to get around the default "Begins With" search if that is not what you want. By specifying a tick mark at the beginning and end of a prompt value, such as '123456789', you will only get records returned that have a value of 123456789. Version 5.0.x.15 of GTViewer is available. - FIX - Minor fix to Attribute Info on very large .gtx files. It would sometimes say that the index file could not be opened (with the .gtx file as the index file). - FIX - Hyperlink items would sometimes not be correctly identified if the filename had numbers in it.